This project is a component of the Working Landscapes Riparian Enhancement Project funded by the California Department of Water Resources through Proposition 84. Funding was also provided by the California Natural Resources Agency’s Environmental Enhancement and Mitigation Program. 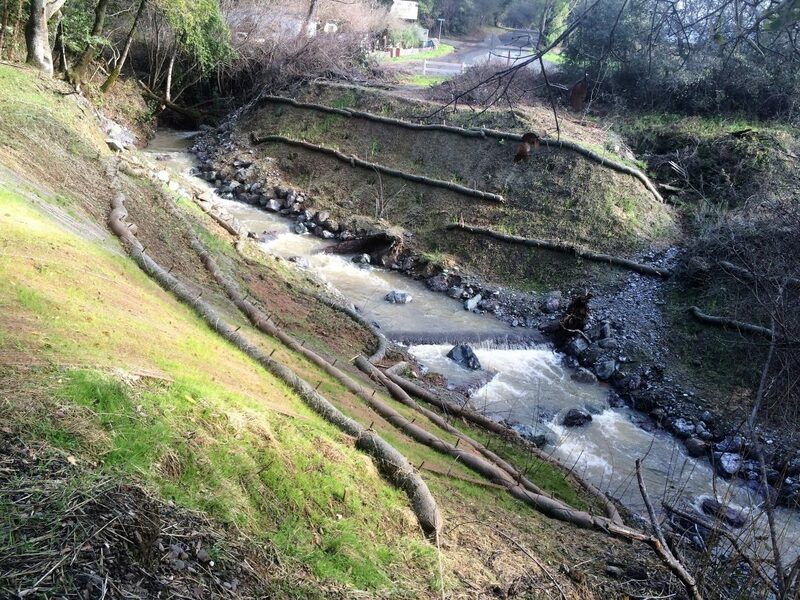 Work in Denmark Creek included removing a 100-foot long culvert, restoring the natural slope of the stream banks, installing log and boulder structures, and revegetating both banks with native species. The site is located on an abandoned section of Highway 128 between Boonville and Philo. The old road crossing had eroded over the decades, the culvert rusted through, and the site was a barrier to migrating steelhead trout and other aquatic species. Irrigation of native plants is provided by quart cartons of Dri-Water™.